JANUARY 10, 2008, NEW DELHI The two basic processes in cement production are the wet and dry processes which are named after the manner in which the raw mix is introduced into the kiln. In the wet process the mix is introduced into the kiln as a slurry with 20-40% moisture. The mix is introduced dry into the kiln in the dry process. Dry process kilns are generally shorter because there is no need to evaporate the slurry moisture from the mix. Reduction of moisture content improves plant fuel efficiencies. Cement production is very energy intensive involving both heat (clinker production) and electricity (grinding of feed and clinker). The most modern plants in operation today which use the dry process and have pre-calcination and pre-heaters consume around 80 kwh of electricity per tonne of clinker and 600 kcals of heat for each kg of clinker produced. Less modern dry process plants use up to 1100 kcals of heat/kg of clinker and older wet process plants can use up to 1700 kcals/kg of clinker produced. *Calorific value = 6000 kcal/kg net as received basis. Generally little influence composition must suit kiln feed composition. Best quality coking coals 20-35%. High volatile matter results in lower coke yield. Dry process. Limit less severe for wet process. Limit set by capacity of grinding equipment and CV of coal used. Creates handling problems if too high. Ash analysis Ash is composed of very complex oxides and the ash analysis expresses this composition in terms of its component oxides. Generally the ash consists mostly of silica (SiOz) and alumina (Al2O3). The presence of large amounts of the oxides of iron (Fe2O3), calcium (CaO), sodium (Na2O) and /or potassium (K2O) generally indicate an ash with low ash fusion temperatures. 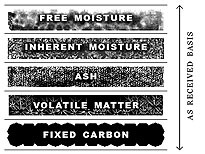 The ash analysis differs from the composition of the minerals in the parent coal.